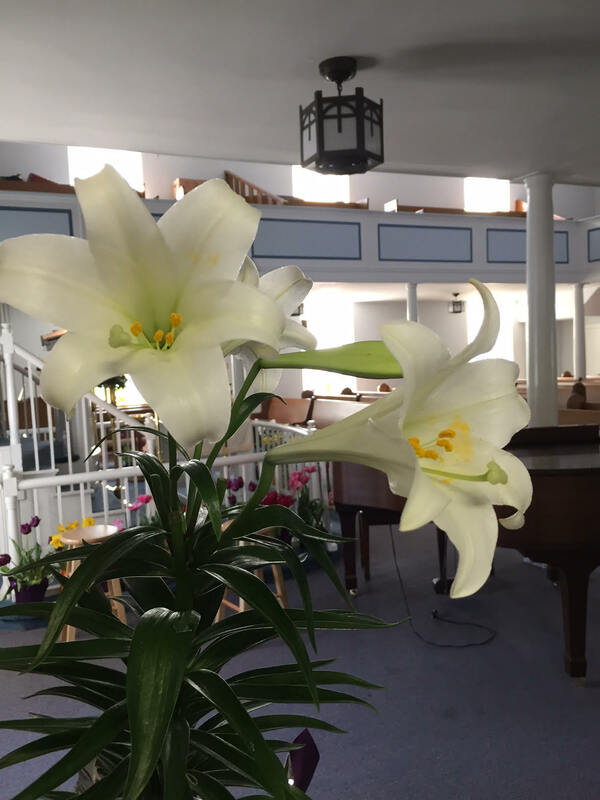 Worship Service with Holy Communion at 10:15 a.m.
Preceded by a Soup Supper @ 6 p.m.
Festival Worship with Holy Communion 10:15 a.m.
Service with Holy Communion at 9:30 a.m.
God loves all people, including you! We are called to be Jesus’ disciples in the world. We do this by practicing the marks of discipleship: pray daily, worship weekly, read the Bible, serve others, be in relationship with God and one another and give of our time, talents and money. The marks of discipleship are goals we strive for in Christian love, not requirements for grace. Meaningful worship grounded in Word and Sacrament in a beautiful and historic sanctuary. Fellowship and community with joyful Christians of all ages in our beautiful and historic sanctuary, modern fellowship center, gym and kitchen. These facilities are available for use by congregational members as well as community groups. Weekly Sunday School, Children's Church, and Children's Messages for our younger members. Vacation Bible School is offered in June. Additional youth events are offered at various times throughout the school year. Adult Sunday School is led by the pastor and runs from September thru May. A Midweek Bible Study, also led by the pastor, meets on Wednesday mornings at 10 AM in the Fellowship Center Conference Room. These studies enrich our knowledge and understanding of the Bible and God's inclusive love for all people. Annual events such as outside worship services and picnics (May and September), Community Thanksgiving Dinner, live theater productions, and fundraisers (candymaking, apple dumpling making, etc.) which promote fellowship and support our assorted mission projects. In 1736, the first Germans from Lancaster and York counties settled in the southern part of Franklin County. One of the earliest of these German settlements was just south of Chambersburg, known as the "Grindstone Hill" settlement. After 1764, the ingress of the Germans was so great that they soon owned the better part of Guilford Township. The Germans loved their church and made early provision for the permanent establishment of the ordinances of religion among them. An occasional sermon was preached to the scattered Lutherans of the settlement by ministers passing through the valley on horseback. The Lutheran and the Reformed congregations united in their efforts to secure a suitable place to build a house of worship. In 1766, the original church, a log structure, was built. It was situated on the opposite side of the highway from the present church, but this new place of worship was not completed for twelve years due to the poverty of the people. The services were held in it although there was no floor or stove for warmth. A stove and other needed supplies were provided in 1778. It was considered one of the finest buildings in the settlement. The log church served a good purpose for sixty-seven years, after which it was sold for thirty dollars and moved four miles east where it became known as "Fetterhoff Chapel." 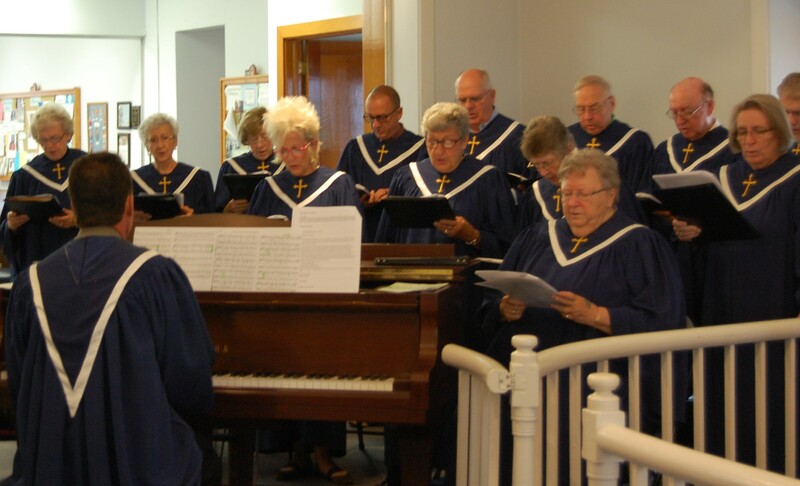 As the Lutheran congregation increased in number, a new church was required. The Lutheran and Reformed congregations again united in erecting another house in which to worship the God of their fathers.The corner-stone of the brick church was laid in May 1833. It was built in the form of a parallelogram, with the pulpit at one end, the doors at the other, surrounded by a spacious gallery. The dedication service was held on November 24th of the same year. The building was constructed for approximately $3,000. On August 20, 1928, extensive improvements were started on the brick church. An addition was added to the front for two class rooms, and a double door entrance replaced the two individual front doors. 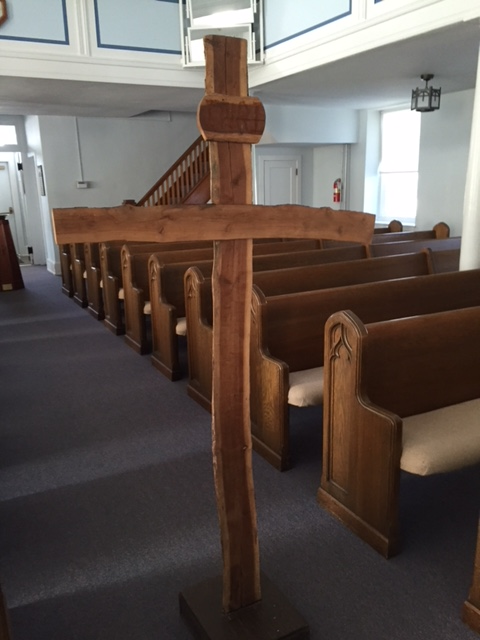 New pews were placed in the main body of the church with a three aisle arrangement instead of two. At this time the church was wired for electricity. I was born in Greenwich, Connecticut and grew up in Basking Ridge, New Jersey. I attended American University in Washington, DC, where I earned a Bachelor’s degree in communications and a Master’s degree in Education. I worked for over twenty years at MCI Corporation in Washington, DC, as a senior manager of event production. A second career pastor, I attended the Lutheran Theological Seminary at Philadelphia (LTSP), where I earned a Master of Divinity degree in 2007. I came to Solomon’s in February 2011, after serving my first call as associate pastor at Faith Lutheran Church in Arlington, Virginia. My wife Kristy (a certified teacher and elementary school librarian) and I are the proud parents of two young children—Katy and Samuel. We enjoy the relaxed pace and welcoming community in Chambersburg and Franklin County. I felt called to the ministry when: I was energized by serving as an assisting minister and deacon of social concerns at my home church and the Holy Spirit nudged me to serve in ministry fulltime. Since I met my future wife Kristy on a Habitat for Humanity project through church, I sensed God was leading me in this direction. The thing that I most enjoy about Solomon’s Lutheran Church is: The warm, inviting disciples here who are excited about ministry and serving others. I see God at work among us when: Members and guests feel the grace and love of Jesus Christ present in our Spirit-filled worship services—we are truly an active and passionate Christian community! My favorite things to do in my spare time: Spending time with my family, working in my yard and splitting wood at our cabin in the woods. I also love music and reading books and the Washington Post on my Kindle. Every morning I start my day by: Drinking coffee, reading the paper and helping Kristy to feed our children breakfast. I knew God was present in my life when: Kristy and I were blessed with two wonderful children and I was called to an amazing church in beautiful Chambersburg, Pennsylvania. Something interesting about me that would surprise people: I own an extensive collection of Jazz and Blues LPs (and even some 78s!) and I’m left-handed. Nursery: Nursery services are available during the worship service. Please bring your child (up to 3 years of age) to the nursery downstairs and they can be picked up after the service is over. 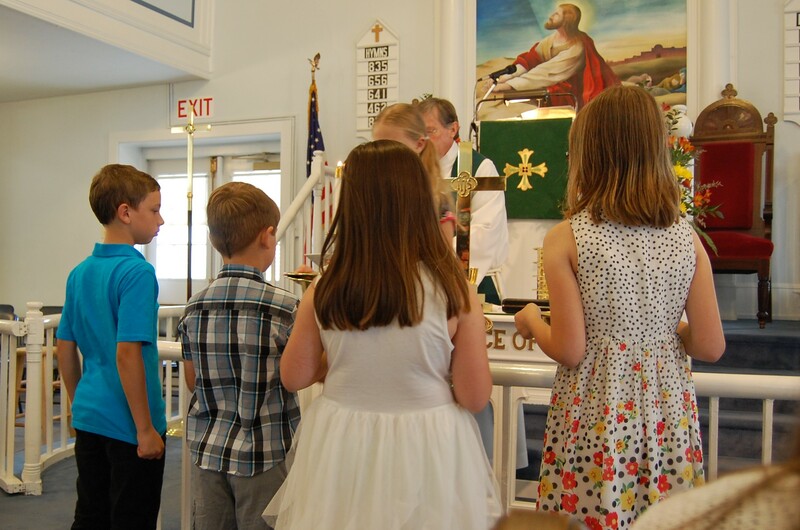 Children's Church: During our Sunday worship service, Children's Church is offered from September through May. All children are invited to take part in our Children's Church Program. Prior to the first Scripture Lesson, the children are invited to join our adult leaders for age-appropriate Bible reading, a craft, and prayer. They return to the sanctuary during the offering. Vacation Bible School: This year's VBS will be held June 17-21, 2019. Our theme will be "Roar!" as we go on safari to learn about Jesus. Sunday School: Sunday School is held weekly at 9:00 a.m. during the months of September thru May. Council Minutes, Committee Minutes and the Monthly Financial Statement are available in the library for anyone to read.